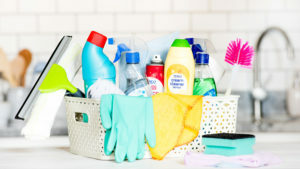 Home Spring Cleaning and Tips to Make Your Cleaning Easier! It’s Time for Home Spring Cleaning! Get Ready and Just Do It! Spring is a great time to conduct routine inspection and maintenance of your home. We have put together must-have home spring cleaning tips to help you keep your home looking tidy and desirable throughout the year. To avoid costly repairs later, follow these tips to ensure your home stays in great shape during spring and beyond. Inspect your lawn to make sure it is ready for summer growth. Rake leaves and branches, weed, fertilize and aerate the lawn. Trim tree branches that are overlapping over your home to prevent them from breaking and crashing through the roof. Inspect the foundation of the building for cracks or gaps in concrete areas like patios, driveways, and walkways. Keep your outdoor patio furniture well maintained and regularly cleaned to make it look good for the summer season ahead. Inspect the exterior door and windows and repair any faulty handles and loose locks. Check for cracks or gaps on windows and seal with caulk or weather stripping. Also, make sure you dust and clean window and door screens. Inspect the roof for leaks, missing or damaged shingles and consider repairs. Remove any downspout clogs and repair any gutters leak so that there’s no room for water being redirected. Don’t forget the wood deck. Consider staining and refinishing the wooden deck in readiness for summer. Inspect the septic tank including outdoor water systems, faucets, pipes and in-ground sprinkler systems. Hire HVAC professional services to do a thorough inspection such as changing air filters, cleaning the air conditioner, checking the coolant level, testing safety measures and checking for unit leaks. Check the furnace filter for dust buildups and clean it thoroughly. This saves you on utility costs. Check the smoke detectors and replace the batteries, if necessary. Inspect shower, tubs and sink drains for clogs and check the caulking for damage. Clean faucet aerators and remove mineral salts from showerheads. Hire a professional to inspect the fireplace, dust and clean it properly. Inspect the kitchen to make sure it’s clean and tidy. Thoroughly clean countertops, cabinets, and the sink. Empty everything from the refrigerator to clean both the inside and outside. Also, clean grubby microwaves and stovetop using non-toxic spray and appropriate cleaners. Clean carpet. Ensure that your carpet or linoleum looks cleaner and in good shape. If possible, consider hiring professional carpet cleaning service for thorough cleaning and care.